I could not be more happy with our choice to hire Maria! She has been extremely helpful every step of the way and we are so excited to have be be a part of our wedding day. Early in our hunt for someone to marry my now wife and I, we found Maria and instantly knew she was the right choice. Maria is amazing she is so cooperative she works really hard to make sure everything flows well and here aura is so enjoyable. Even in our most stressed moments her joy helped set us straight again. She comes highly recommended for all your wedding needs. Working with Maria was the Best! Working with Maria was like working with a guardian angel, a cheerleader, and a therapist all at once. The process of getting married can be overwhelming and stressful, and Maria consistently helped us to stay calm, focused, and excited. She gave us so much guidance, and enthusiastic support. She is a wealth of information and her love for her work shines through the entire process! From the very beginning, her passion and her enthusiasm were infectious. We had a magical wedding and we are so thrilled that we chose Maria as our officiant. We are going to miss having an excuse to see her and talk with her on a regular basis! We recommend her highly and whole-heartedly. We couldn't imagine our wedding without Maria! We can’t say enough good things about Maria. We took choosing an officiant very seriously, we wanted to find someone who was experienced in the role and could also seem like they knew us. By the time the wedding day came Maria didn’t seem like she knew us, she DID know us. She prepared with us so thoroughly and thoughtfully, she couldn’t have been any better. I think no compliment can go any further than the fact we had guests all night telling us how beautiful they thought the ceremony was, and that was because of Maria. We’d recommend her to anyone. Maria was absolutely incredible, I can't imagine anyone else as our officiant, nor would I want to. She listened to all of our hopes and dreams and made them all come true. She truly made our wedding day all about my wife & I. At the rehearsal she even kindly told our friends, bridesmaids, groomsmen, parents, etc. to direct their questions/concerns away from us so we could enjoy our day and live in the moment. I could go on forever, but all you need to know is that Maria will go well out of her way to make you happy and to give you the exact ceremony you're hoping for. Can't thank her enough! This review has been a long time coming, but I truly needed to be able to put into the right words what Maria's services meant to us. Our wedding was 6 months ago today, and while all of the details were important, we knew that the ceremony was the thing that we really wanted to get right. We were looking for meaningful, honest, romantic, and with the right combination of sentiment to combine our lives together, with both our families and my 3 children. After explaining all of this to Maria via Skype and in person meetings, we knew that we had the right professional in our corner. It was SO important that we created a basis for our marriage and not just for the wedding day. And we did. During the ceremony there were tears, there was laughter, and most importantly we didn't have to stress about anything. Maria was able to consult through the whole process (even proof reading our vows to ensure we were both on the same page with length and tone) and bring my three kids into the fold in a way that felt natural and appropriate. As someone who works in the wedding industry, I see a lot of wedding officiants (and ordained family members, friends, etc) at work. Some wonderful, and some not. The most important thing I can say about Maria is that she is not just performing the ceremony. She is crafting these moments WITH you in a way that doesn't feel contrived or rehearsed. We had to change a part of our ceremony last minute because of pregnancy (whiskey and babies don't mix) and she offered an immediate solution and revised script that took any stress away before it even started. Our rehearsal was efficient and fun, and everyone knew what was happening at all times. If you are looking for a professional that becomes a friend, and who will do the best job possible, we highly recommend Maria. We feel very lucky that we found her. Maria was the best investment we made towards our big day! 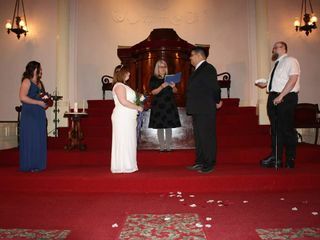 At the beginning we were slightly skeptical because some other officiants price points were much lower and it seemed like an area we could maybe cut costs. 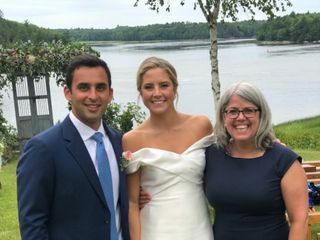 However, Maria played an integral role throughout the entire process and it would not have been the beautiful and fun ceremony it was without her. She guided us through everything, making the process easy and fun. Her positive energy radiated through email, phone calls and certainly through the wedding ceremony. I would not hesitate to recommend Maria to anyone. Where do I even begin! My husband and I got married this past August in Maine, and Maria went absolutely above and beyond to help make our entire wedding experience perfect. From the moment we first skyped with Maria back in January, we knew she was exactly who we were looking for to perform our wedding ceremony. Maria is thoughtful and kind and helped us tremendously throughout our wedding planning process all the way through the end and for weeks beyond. 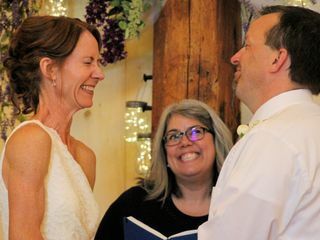 She was, and is, so much more than a wedding officiant. She is a source of guidance and support, she is understanding, and you can see that, to her core, she is passionate about the work she does and the mark she leaves. I can’t think back to our wedding weekend without feeling so much love for Maria! She conducted the rehearsal walkthrough on Friday seamlessly and made it fun and special. On our wedding day, it started pouring rain 30 minutes before our ceremony start time, and she was there with grace to help talk us through a plan B or a plan C. Thankfully, the rain eventually and suddenly stopped. We didn’t know how long to rain would hold off, but Maria didn’t skip a beat. She had our 23 bridesmaids/groomsmen, 4 ushers, a ring bearer and a flower girl, 4 parents, 2 grandparents, and 250 guests organized and ready to go within minutes - and she didn’t even seem phased. Maria seemed to be the anchor of our wedding and I can’t thank her enough for all that she has done for us and with us over the past 10 months. We are so grateful and feel lucky to have had her by our side. I realize I haven’t even mentioned the written ceremony itself - as you probably already guessed if you’ve read through this in it’s entirety, it was perfect and exactly what we hoped for and more. Maria - we love you! Thank you for everything! Maria was an absolute dream to work with. From the second that we met her we knew we had to have her officiate our wedding, and it was one of the best decisions we made! I cannot give Maria enough praise! So many of our guests could not stop complimenting her and her beautiful words. She truly took the time to get to know us as a couple and that reflected in our ceremony. I would absolutely recommend Maria to anyone getting married in the Maine area, you won’t be disappointed! THANK YOU! Maria is AMAZING!!!! My husband is French so we wanted to make sure that we had a ceremony that included both cultures as much as possible. Maria was open minded and was able to turn our ideas into reality. It turned out to be our dream ceremony. Everyone was so impressed with the ease of the ceremony and the way she spoke. Even the French people were able to understand her because she spoke slow and clear! I would recommend her to anyone getting married. It will be one of the best decisions you make. She makes it so easy and fun! Maria was the icing on the cake for our wedding. From the very start of the process, Maria was professional, helpful, and completely organized. She was able to guide us through every aspect of our wedding ceremony, and we were able to fine tune it our way so that it was very personal. Our wedding would not have been the same without Maria. 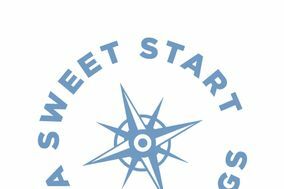 Alaina and I are forever grateful for “A Sweet Start”. Our wedding ceremony was incredible which was a direct result of Maria’s warmth, insight, professionalism and organization! Our guests raved about her composure, enthusiasm and delivery. It felt like she was a part of our family and she is now a friend for life! My wife and I could not have been happier with Maria as our officiant for our special day. She was honestly incredible and pulled the entire ceremony together. We could not have had such a special ceremony without her input and expertise. Her energy and positive disposition really made the event what it was. We could not recommend her more. 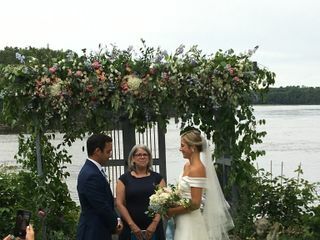 Maria delivers such an amazing and unique experience as an officiant. We knew we had made the right decision in hiring Maria immediately after our first skype conversation, and you know its a good sign when every other vendor you have booked exclaims "Oh, you booked Maria! She is the absolute best! I love her!". 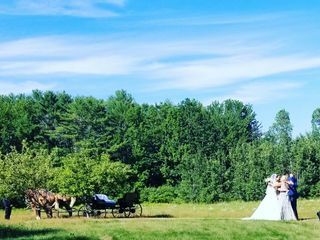 Her connection with the Maine wedding community made her a wealth of knowledge of vendors and logistics, but what makes Maria truly unique and the best officiant we could have ever imagined is the detail and effort she puts into creating a truly one-of-a-kind ceremony. We spent several months going back and forth personalizing every moment of our ceremony, and the end result was something that was so special that we have heard from guests routinely telling us it was the most incredible ceremony they had ever seen. As if that wasn't enough, Maria also makes the rehearsal and ceremony itself completely relaxed and immersive. She has an excellent presence, and was this perfect combination of grounding and calming while also keeping you so present in the moment and the result is that I remember every single detail of our flawless ceremony. She kept all the pieces moving together like clockwork while my husband and I stood there, completely engrossed in the ceremony. I had always loved the idea of being married by an officiant who was a friend and had a sense of our history as a couple. I can truly say that by hiring Maria, we had that experience because it is impossible to make it down the aisle that day without feeling so close to her, and generating a lasting connection. Thank you so much Maria! You crushed it! My husband and I are forever thankful for Maria’s ongoing support, creativity, and passion for what she does. She put her heart and soul into every aspect of our ceremony and was truly able to capture our personalities and vision. I don’t think there was a dry eye in the house. And that includes all the laughter that took place. We has such a blast! Her flexibility and ability to problem solve is also something that can be extremely hard to find. Whether it be phone, email, or text, Maria was always accessible and made sure to check in multiple times throughout the process. She kept me calm right up to the wedding day. Thank you Maria for making our wedding weekend so memorable and for telling our story. You truly have an amazing gift. And to any future brides- Maria will be the best decision you ever make! What can we say about Maria? From the moment we met (via Skype) we knew Maria was the person to marry us. Her experience, knowledge of vendor partners and the area, as well as her incredible passion for her work all proved to be invaluable. 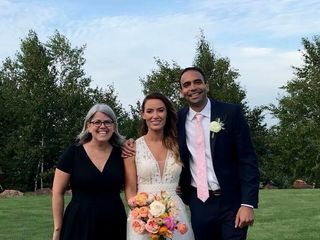 Having been involved in many weddings, but never our own, both my wife and I found Maria to be the most professional, caring, involved, and exciting officiant we've ever been around. From start to end, her guidance through our experience was incredible - Maria walked us through our ceremony, taking careful note of minute details to build out a touching, personal ceremony that came to life beautifully. Beyond just drafting the ceremony, Maria's command of the ceremony, ability to corral those involved, and remind us to stay in the moment was everything we needed, but didn't expect. For any couples looking to tie the knot, Maria is worth every penny and then some. Our day was beyond words, and a major part of that was her professional knowledge, love and support. As of today, Maria is no longer our officiant, but a close family friend! How can I even begin to write about our experience with Maria? My husband and I were feeling anxious about finding the right person to officiate our wedding. We knew we wanted something special, personal, real, and fun without religious undertones, but had no idea where to begin. 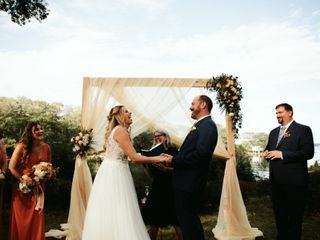 We set up a video call with Maria after reading reviews online and felt an immediate connection with her; we knew she was the right person to help us craft our fully-custom ceremony! From that day forward Maria was communicative, clear in her expectations, and available whenever we had additional questions. She set deadlines for us throughout the process, which allowed us to take the time we needed to be thoughtful about the pieces of the ceremony. We went back and forth with her over ceremony drafts 5 or 6 times, and it was finalized about a month before the wedding. I can't tell you how important this piece was - we had so many other things to think about in the weeks leading up to the wedding and I was so happy that we didn't have to scramble to write anything. The week of our wedding, we touched based again just to make sure we had all the timing right, and Maria made great suggestions about how to handle other details, like the processional. When it came time for the rehearsal, Maria was fun and assertive, making sure everyone knew where to be, which took so much pressure off of us and allowed us to relax and enjoy it! Thanks to Maria's help, our ceremony was just as we envisioned it. So many people commented later that they loved her energy and couldn't believe she hadn't known us for years! We watched our wedding video this week and couldn't stop smiling re-living the moment. It was perfect. I can't say enough about Maria. She helped us come up with a beautiful, personalized ceremony, was a total pro guiding our wedding party through the rehearsal, and did everything she could to make our big day special. Her positive attitude and enthusiasm made her such a hit with everyone at our wedding. Thank you so much Maria!! Choosing Maria of A Sweet Start to officiate our wedding day ceremony was hands down the best decision we made during our wedding planning process! My husband and I are not very religious and knew we wanted to get married outside, but that was about all we were sure of. After meeting Maria on Skype, we knew we could fully trust her to help us create the ceremony of our dreams. Maria custom tailored a ceremony for us that was unique and meaningful and she embraced our idea of a beer ceremony and turned it into reality! My husband and I are in our mid 20's so we thought most of our guests would be talking about "the party" the next day, but everyone could not stop raving about our ceremony! I had multiple people tell me it was the most beautiful ceremony they had ever attended. I cannot recommend Maria enough! My husband and I chose Maria to be the officiant at our wedding. I could tell from the beginning that we made the right choice. Maria was very professional but also extremely personable. She will work with you on customizing your ceremony so it's unique and special. When we finally met Maria in person the night before our wedding she brought such a positive, humble energy to our wedding party. She was very organized and you could tell she was extremely comfortable with helping the wedding party understand what they needed to do on the wedding day and where they needed to go. On the day of our wedding she was very supportive and made me feel like okay, I CAN do this! She read our ceremony perfectly! I really can't describe in words how amazing Maria really is. I couldn't imagine any wedding without her!! From the very first email with maria I could tell we had found the perfect person to marry us! Maria is so nice and sweet and if you ever have any question about anything she always gets right back to you with an answer! We lived a little far each other so we did FaceTime calls which where great!! She also has amazing ceremony's you can pick if you choose to do that like we did! When it came to our vows brandon and I wanted to write our own maria looked over each of ours gave us feedback and even helped make things flow better with our words AND put them on cards for us to read on the day of. When it came to wedding day maria was nice and early and was checking in with me to make sure everything was going good. She also let us know when it was time to start! I couldn't have asked for a better experience from a better person! Maria being our justice of the peace was one of my very favorite parts of our day!! We feel so lucky to have Maria part of our lives after officiating our wedding in July 2017. From our first Skype conversation, we knew Maria was the perfect person to help us building a warm, loving, personal, secular ceremony. Even though the ceremony was the most important part of our wedding day, we didn't know where to begin and we collaborated with Maria to work from her expertise to build a ceremony that felt entirely our own and so authentic to who we are. On our wedding day, we found ourselves more emotional that we expected, and Maria was our rock and helped us be in the moment and get through the tears! Maria was so responsive and thoughtful throughout our planning process and was a great sounding board for other elements of our wedding. We had a fantastic check in with her a few months before our wedding where we went over every detail, and she prompted us to think of things we hadn't considered and had expert guidance and experience to help us build a ceremony we were so thrilled with. She also led our rehearsal ceremony and our families and wedding party was blown away by her warmth, attention to detail, and positive energy. We could not have imagined our wedding day without Maria! Any couple will find themselves in such supportive and thoughtful hands in working with her. We worked with a lot of great "vendors" on our wedding day, but Maria was the best.